Make sure to mix ingredients in the proper order. 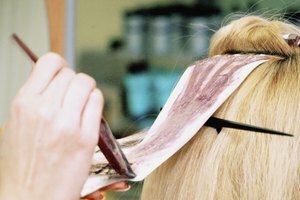 Do-it-yourself hair dyes are easier than ever to manipulate, which means you'll rarely get caught in a hairy situation when it comes to dying your hair at home. The most important things to remember are to choose a color similar to your natural hue, mix the ingredients thoroughly and use a steady hand at achieving an all-over, even color. When done right, your at-home hair-dye job can save you time and money whether you're playing on the field during the week ... or playing the field come the weekend. Take everything out of the box and account for the ingredients. Read the directions thoroughly before preceding. Put on the gloves provided in the package. Pour the necessary ingredients into the bottle. Screw the cap on tight and shake vigorously to mix the ingredients together for about two minutes. Cut the top of the bottle with sharp scissors. Drape an old towel over your shoulders to protect your clothing from dye drippings. 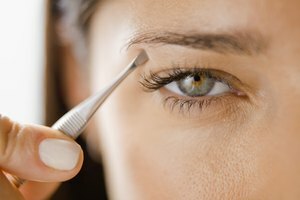 Dip a cotton swab in petroleum jelly and run it along your skin next to the hairline. This acts as a barrier between the dye and your skin in case your skin is sensitive to the dye. 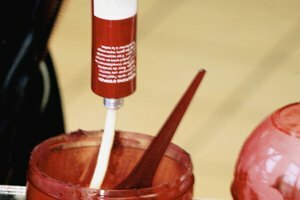 Turn the bottle over on top of your head and squeeze to deposit the color. Use your fingers to guide the color around in small sections. It's a good idea to first start with the color near your forehead and sides if you are going darker. When going lighter, start in the back near your crown and neck area. Leave the dye on for the recommended amount of time. If you have some gray hairs, cover those first and read the instructions in case there is additional wait time. Rinse your hair in the shower until the water runs clear. Follow the manufacturer's instructions as to conditioning with a provided treatment or washing your hair with a color-stay shampoo. Hair dye always goes on top of dry hair. Dye works best on gritty, slightly dirty hair. Add a weekly conditioning treatment to your hair when it is colored. Use a color-safe or enhancing shampoo and conditioner for future washings. If you want a color three shades darker or lighter than your natural hue, visit a professional hairstylist. Finn, Lisa. "How to Dye Your Hair at Home for Guys." Synonym, https://classroom.synonym.com/dye-hair-home-guys-22924.html. Accessed 20 April 2019. Approximately How Long Does Hair Dye Stay in Hair?